Ultimate Speed Cooking! Bacon in 30sec! Fish Fillets in 50sec!Juicy Stakes in 90 sec! 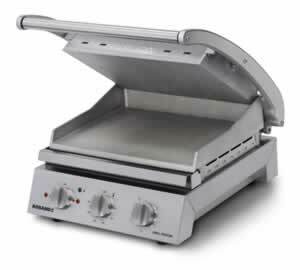 Perfect Veg, Chicken, Chops or up to 8 Paninis in 3 minutes + Burgers & Kebabs. In Short Double your sales by quicker customer turnround. Top Quality from Metcalfe Six Slice or Eight Slice available.